SINGAPORE - The best of the international fashion labels and Parisian Haute Couture will, for the second time, descend upon The Shoppes at Marina Bay Sands, as the 2nd Women's Fashion Week and French Couture Week 2012 Singapore kicks off from 23 - 25 November and 29 November - 2 December respectively. 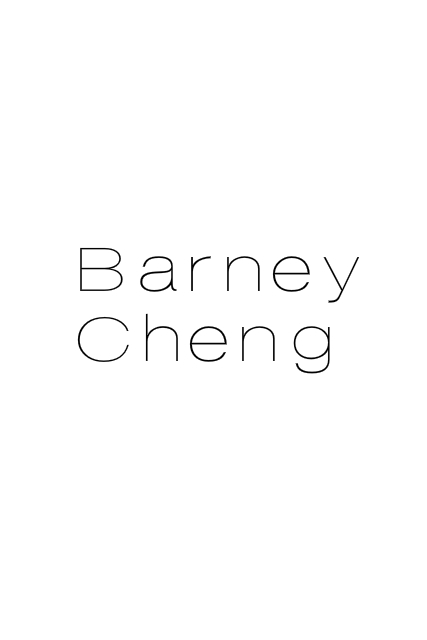 Two new couture shows, spotlighting Asian Couture labels from Bangkok, China, Hong Kong and Mongolia, and Japanese Couturiers have been added to the already impressive line-up on the 27th November and 28th November respectively. Held at the Rain Oculus, Marina Bay Sands, this highly anticipated nine day fashion event will feature the latest prêt-à-porter collections from international labels during Women's Fashion Week 2012 Singapore, while the French Couture Week 2012 Singapore will showcase exquisite Haute Couture pieces from Parisian Haute Couture houses. 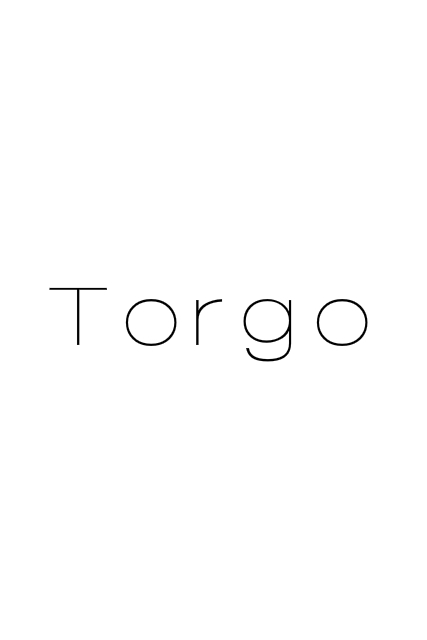 - Japanese designer Mr Kenzo Takada. In addition, an international DJ Mr X, UK-based Asian Ballet Dancer Mathew Koon, Korean-American "Prince of Ballads" Tim Hwang and top models from Mongolia and China will add more glamour to the event. 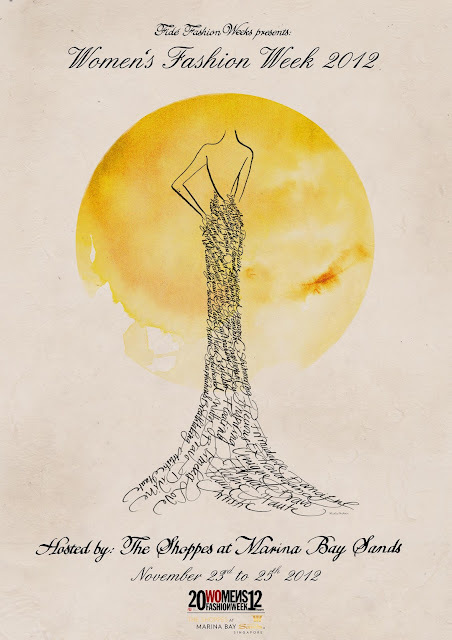 Mr Mark Juliano, Senior Vice President of Marketing, Marina Bay Sand, said, "With the second installation of Women's Fashion Week and French Couture Week Singapore, The Shoppes at Marina Bay Sands has raised the bar yet again as the leading fashion destination in Asia.  We take great pride in presenting a world-class platform for our retailers to showcase their best to a wider Asian and international audience. With the outstanding architecture that The Shoppes at Marina Bay Sands has to offer, this is a golden opportunity to show our support and commitment to our retailers in making this year's event an unforgettable one". Dr Frank Cintamani, Singapore's Chairman and Founder of Fide Fashion Weeks array of fashion innitatives, said, "It is important to first understand that Haute Couture embodies the very highest discipline in fashion. 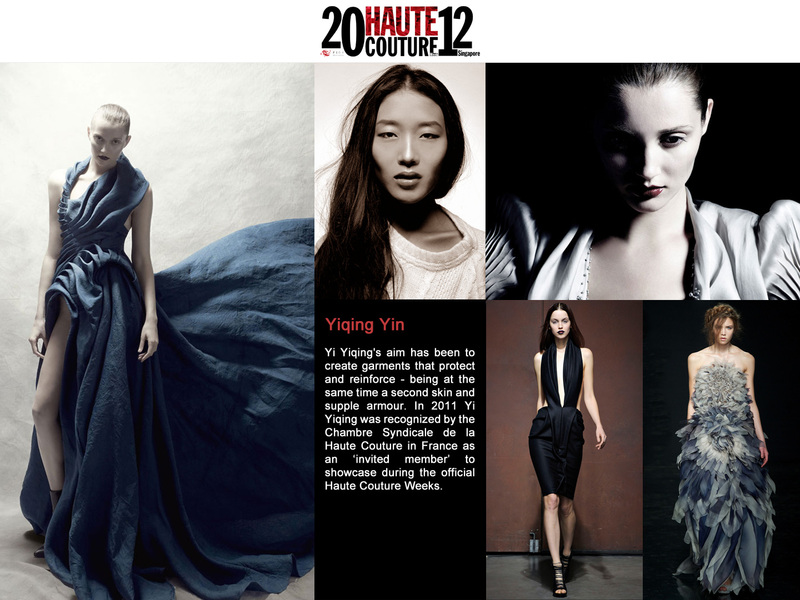 Only then we will appreciate that the future of Haute Couture must include Asia. 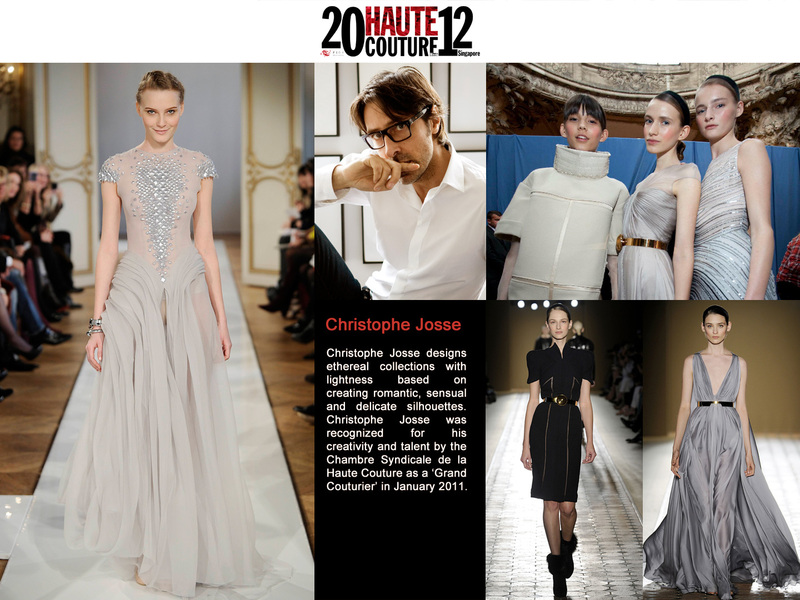 Like the last year, there will be eight designers who are either Grand Couturiers or invited members of the Chambre Syndicale de la Haute Couture. 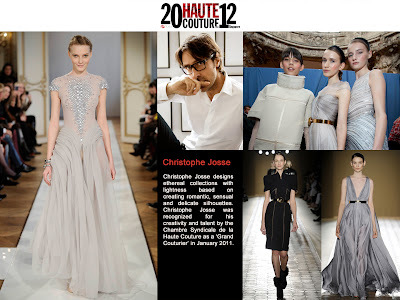 While the focus will still remain on the rich heritage and exquisite craftsmanship that are inherent to Haute Couture, several of these Haute Couturiers have pushed the creative envelope in terms of design by using materials and concepts not traditionally associated with dressmaking." 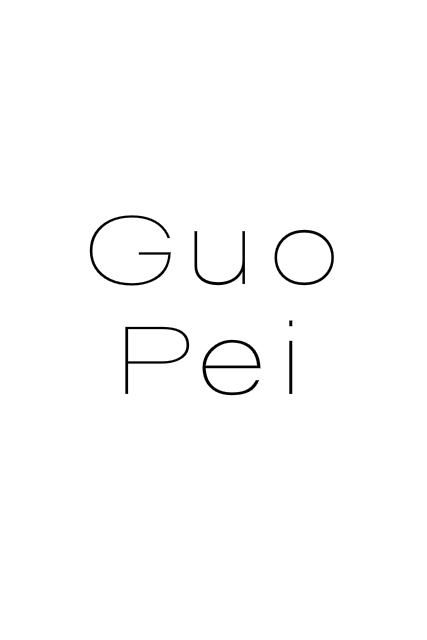 Adding further, "There will be a very distinctive addition to our platform this year with the inclusion of several highly established Couturiers from across Asia, namely China, Hong Kong, Japan, Thailand, and even Mongolia will be represented by seven Asian Couturiers that are supreme designers in their respective countries. 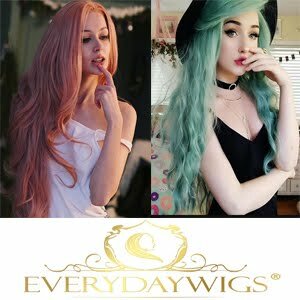 We have carefully selected these elite Asian Couturiers with very determined objective of showing to the world that Asia contributes substantially to the fashion industry than just being the world's consumers and manufacturers of fashion, that we will indeed be a very important force in taking global lead in determining the future of fashion." Four stunning collections by Asian Couturiers will make their inaugural mark at this showcase. 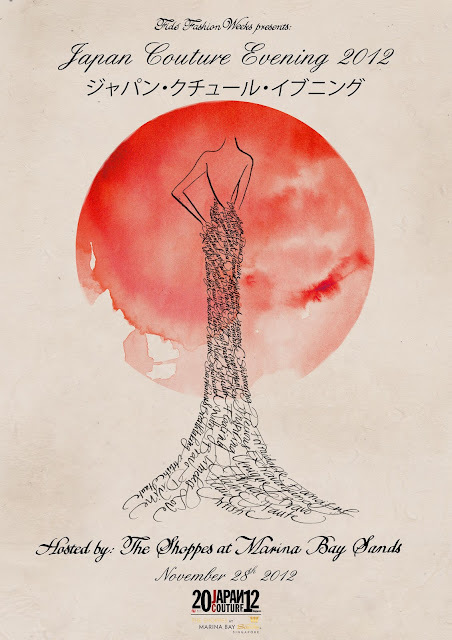 China’s Guo Pei will showcase her complete “Legend of the Dragon” collection in combination with her retrospective collection; Thailand’s Asava by Polpat Asavaprapa will show his Autumn/Winter 2012-13 Collection; Barney Cheng from Hong Kong, while Mongolia’s Torgo by Bold Ochirjantsan close the evening with his stunning Couture collection. Featuring three of Japan’s most respected Couturiers – Somarta by Tamae Hirokawa, Junko Shimada and Yumi Katsura, this showcase is a testament to the event’s commitment to provide an invaluable platform to Asian designers, where they can showcase and gain wider exposure for their creations beyond their domestic shores. 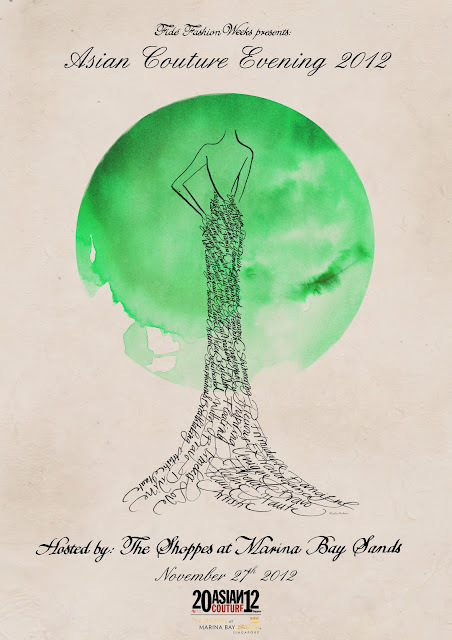 The four-day showcase of the highest form of fashion, Parisian Haute Couture, will be most exhilarating and spellbinding. 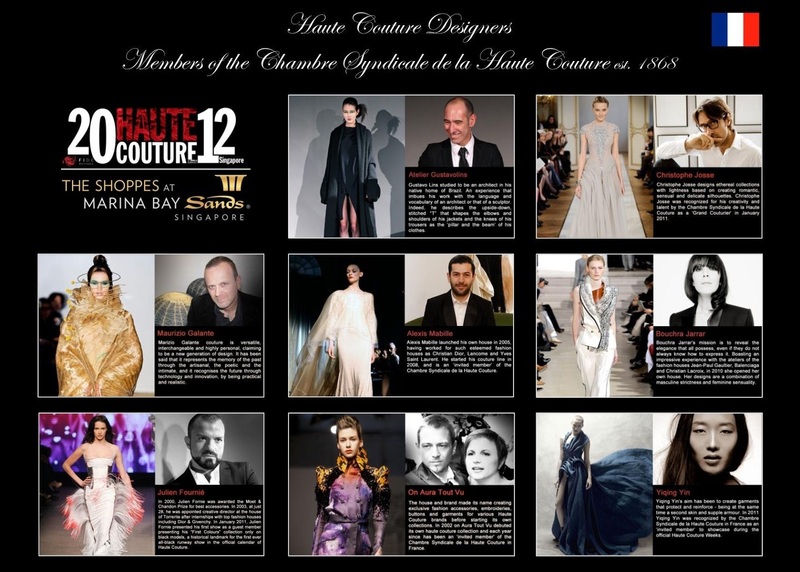 Continuing last year’s debut showcase as a collective in Singapore, this year’s French Couture Week 2012 Singapore will impress with a stunning display of boundless creativity and imagination. 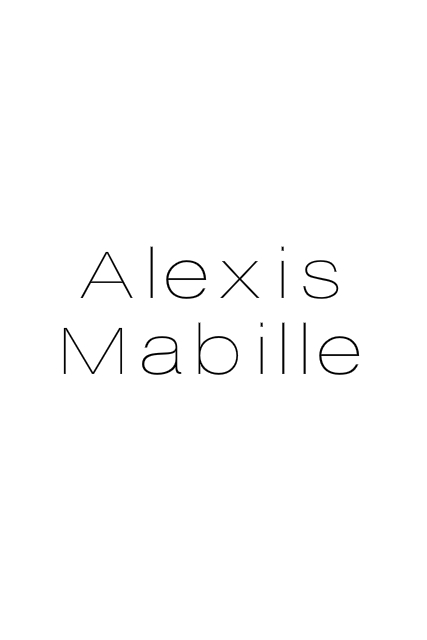 Out of eight to showcase, the three returning Parisian Haute Couturiers, who wowed the Singapore audience last year, are Christophe Josse, Gustavo Lins and Alexis Mabille. Making their debut at French Couture Week 2012 Singapore are Haute Couturiers Bouchra Jarrar, Julien Fournié, Maurizio Galante, on aura tout vu by Livia Stoianova and Yassen Samouilov, and Yiqing Yin. Maurizio Galante, the special guest at last week’s press conference, held at the residence of the French Ambassador to Singapore, His Excellency Olivier Caron, presents a preview of seven spectacular pieces. 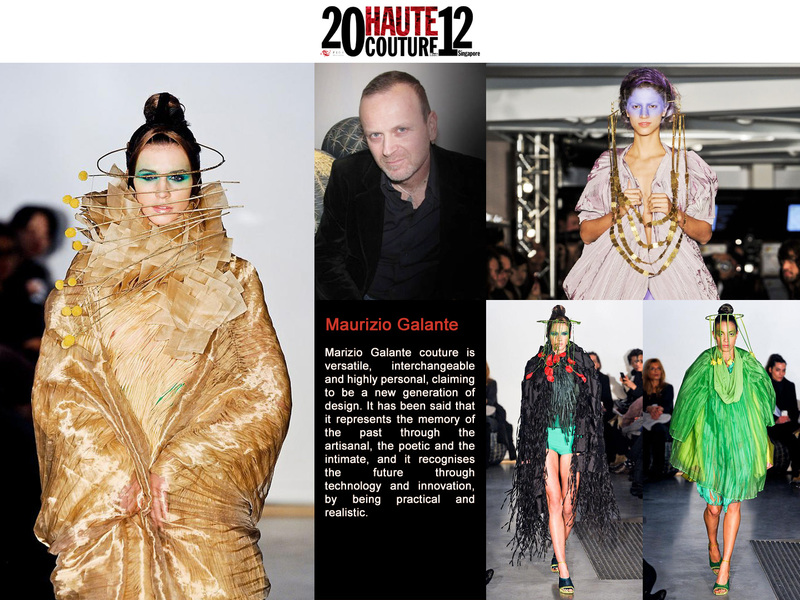 For his show at French Couture Week 2012 Singapore, Maurizo Galante will specially create 15 new creations that will showcase alongside his iconic retrospective pieces. 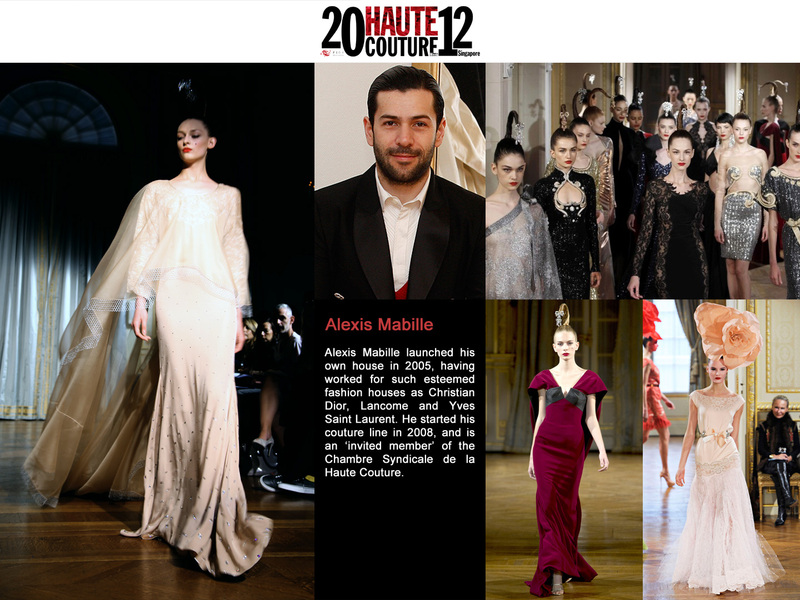 Christophe Josse, Alexis Mabille and Yiqing Yin will present their Fall/Winter 2012 Haute Couture collection, while Julien Fournié will present his Fall/Winter 2012 Haute Couture combined with looks from his First Colours Collection (Spring/Summer 2011 Haute Couture). Gustavo Lins and Bouchra Jarrar are presenting a retrospective collection of their most inspiring creations while on aura tout vu by Livia Stoianova and Yassen Samouilov will present looks from their two most recent collections. All participating Haute Couturiers will rework their show presentation or will specially make new pieces for the Singapore show to give audiences here a fresh perspective. 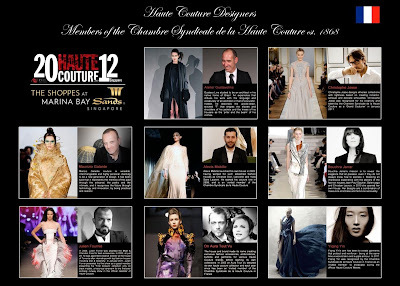 All the Haute Couturiers will also be in Singapore to take their curtain bow after their show. 5.00pm - Parisian menswear designer, Marc-Antoine Barrois, dubbed “Couturier Pour Homme”, was an apprentice to Grand Couturier Dominique Sirop. He will present his styles from his menswear collections starting from 2010 to the present, with several looks that will debut here. 7.00pm - A Couture exhibition with models in Haute Couture gowns showcased in tandem with the use of interactive digital displays to illustrate the various ‘live’ Couture installations. 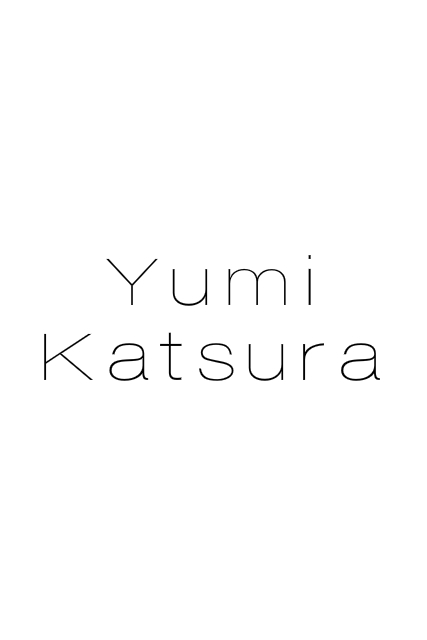 12.00pm - Symposium on the 'Globalisation of Haute Couture' (venue to be confirmed) with panelists - Mr Didier Grumbach, President of the Chambre Syndicale de la Haute Couture, Dr Satoshi Onuma, President of the Bunka Fashion College and Couture designers. 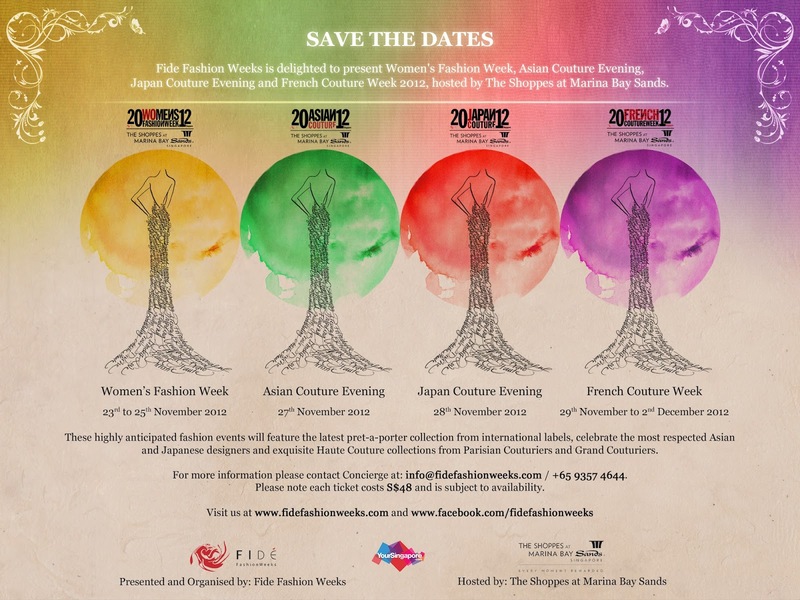 For more show information and latest updates on shows, designers, schedules, personalities attending, please visit www.fidefashionweeks.com and its Facebook Fan page www.facebook.com/fidefashionweeks. 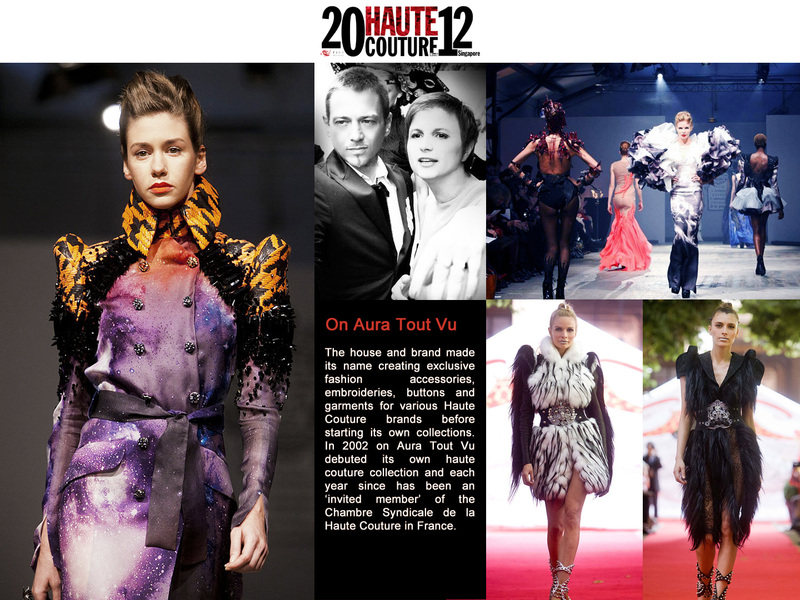 French Couture Week 2012 Singapore is supported by the French Embassy and is a part of Voilah! French Festival Singapore. Marina Bay Sands is the leading business, leisure and entertainment destination in Asia. It features large and flexible convention and exhibition facilities, 2,560 hotel rooms and suites, the rooftop Sands SkyPark, the best shopping mall in Asia, world-class celebrity chef restaurants and an outdoor event plaza. Its two theaters showcase a range of leading entertainment performances including world-renowned Broadway shows. Completing the line-up of attractions is ArtScience Museum at Marina Bay Sands which plays host to permanent and marquee exhibitions. For more information, please visit www.marinabaysands.com. 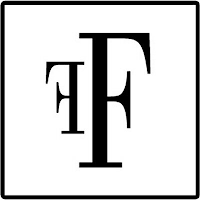 Fide Fashion Weeks have been the leading force behind some of the most exclusive fashion weeks in Asia. In addition to an annual presentation of Women’s Fashion Week and Asian Couture Week, Fide Fashion Weeks complete their impressive offering with the only Men’s Fashion Week in Asia (3rd in the world after Paris and Milan) and the only authorized French Couture Week given permission by the Chambre Syndicale de la Haute Couture to host a collective of Haute Couture designers outside of Paris, France. 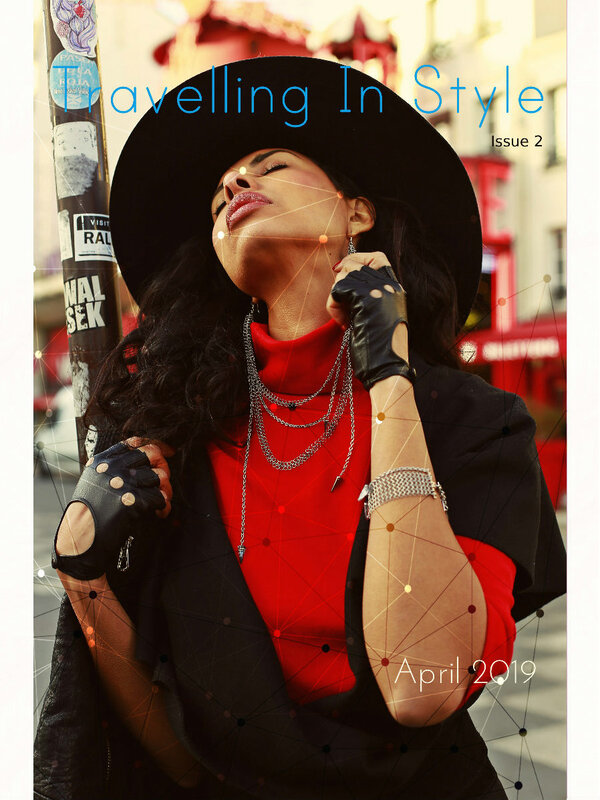 Fide Fashion Weeks aims to maintain its objective of presenting the very best of international fashion in Asia and the creation of a platform for gifted Asian designers to showcase their talents to the world. 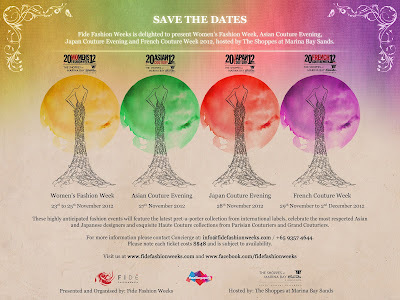 For more information, please visit www.fidefashionweeks.com.